we're pleased to make a small contribution to the news of the day by announcing that Inkdotz by Ink is the winner of the Spoonflower fabric of the week contest. You can buy her fabric in the Spoonflower Etsy shop through Sunday (in a slightly truncated contest week). You can follow the results as they arrive in real time here. Find out how to enter your own design here (submitted designs must already be uploaded to Spoonflower). Good luck to all. While voting still ends today (about three hours form now) for this week's contest, our next contest announcement will be delayed slightly because of downtime on the part of our email provider. We're planning to send the next contest announcement Tuesday morning. This past week's contest has received a record number of votes, which is great to see [Inkdotz is winning.]. If you missed it, see the announcement from last Monday here. Congratulations to Rachel Galloway of Mamma Made Designs. In a tussle between beasties, her lions managed to defeat the goats, bucks and assorted animals of Wild West by Becka Rahn. You can buy Rachel's fabric for the next seven days in our Etsy store. If you've never looked at it, do take a few minutes to peruse Rachel's work. She is also the author of an extensive series of tutorials on designing fabric that are linked from our FAQ page. Go, Rachel! And now for this week's contest. We've been trying to figure out how to get through the entry queue a bit faster, so this week we're altering the rules slightly to vote on six, rather than four, designs at once. That may make deciding which one you like best that much harder, but it will also mean that more Spoonflower designers get to participate. Vote here. Follow the results as they come in here. 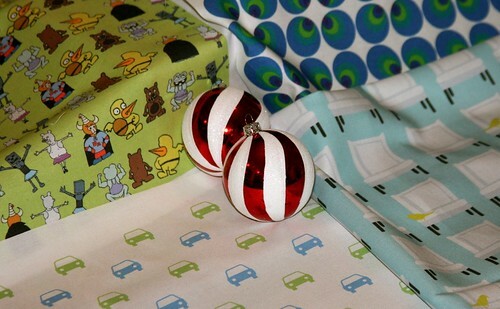 Find out how to enter your own design (must already be on Spoonflower) here. Wolf and Little Red Wins! Congratulations to Gumball Grenade, whose Wolf and Little Red design won the most votes this past week in Spoonflower's fabric-of-the-week contest. For the next seven days — and no more! — you can buy her fabric at the Spoonflower Etsy store. If that doesn't tempt you, she's got her own Etsy store, too. I happen to really like the design from last week that placed last in the votes, but as always, we think all of you who are submitting designs to the contest are great. Thank you! Vote here. Review the rules here. Follow the results as they come in here. Royal-forest by Mary Brewer of Butler, Pennsylvania. wins this week's Spoonflower fabric design contest. Congratulations to Mary for her lovely design, which you can buy — for the next seven days only — in Spoonflower's Etsy shop. Be sure to check out Mary's other work on her blog, Royal Forest. As always, thanks to all of the designers who participated. We think you are all great. four more diverse designs, so be sure to cast your vote for the next fabric-of-the-week. Vote by clicking on the image to the right. You can review the rules for submitting your own design here. You can follow this week's results as they come in here. Congratulations to Laurie Wisbrun, of Austin, whose lovely “Birdies On Chairs” (one version of it, at any rate) won this week’s contest. You can buy her fabric for the next week in the Spoonflower Etsy shop, and after that you’ll have to limit yourself to the fabulous items for sale in Laurie’s Etsy shop, Scarlet Fig. Be sure to vote this week. As always, you can review the results as they come in here, and review the rules here. Congratulations to JoyBucket + 4 New Designs! "collage_fabric_cropped" by joyce vance, 500 . Thank you to all of you for participating! Don't forget to vote for the fabric of the week before this week's contest ends this afternoon (3pm EST). "bloom_in_red" by Rachel Walsh of Dublin, Ireland.